A name like that already suggests a rare and special pen! 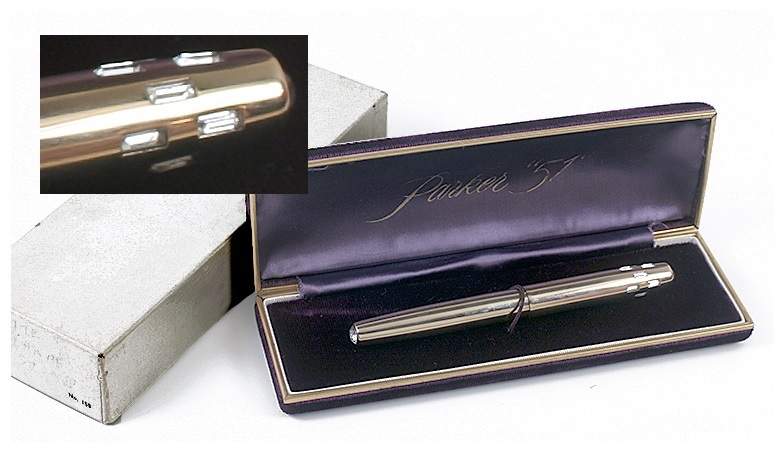 This 1950 Parker 51 Princess Demi Aerometric-filler is gorgeous. It is the smooth gold-filled finish, with a cap surrounded by 12 rectangular clear glass crystals. Different size, shape and color jewels were used, and a sample bag of other of these original jewels are included. This model is correct with no clip, and it has a fine nib. It’s a new-old-stock pen, complete with the even rarer original purple velvet inner and white outer box. Collectors, this is a rare find! Check it out in Catalog #76! This entry was posted in Vintage Pens and tagged Extraordinary Pens, Parker. Bookmark the permalink. Follow any comments here with the RSS feed for this post. Post a comment or leave a trackback: Trackback URL.